If you are not as happy as you would like, you are not alone. But you can do a lot to be happier, if you become more self aware of your thoughts and actions. Some things you can do that affect your mood in big ways are small things that are simple and easy to do, while they also increase your daily motivation to stick to goals and habits you want to achieve. We tend to notice how big things affect our mood. Taking a vacation to Hawaii, marriage, divorce, death, and serious financial issues are a few of the big items. However, small things can also impact your mood is a big way, and the small things happen more frequently. Understanding the small, day-to-day experiences that impact your mood is important. If you're feeling sluggish or irritable, you might just need a drink of water. Some people don't have the benefit of good thirst mechanisms. Have a glass of water at least every few hours. Your mood might improve considerably. There are at least a few songs that impact your mood in a positive way. It only takes a moment of listening before you can feel your mood shift. Try to listen to a few songs you love each day. Upload them to your smart phone so they're always handy. Certain smells can alter your mood. Your smelly cubical mate has one effect. A scent that reminds you of your all-time best date has a different effect. Too hot, too cold, too wet, too dry, or just right. A nice day lifts your mood. A dark, rainy day can drag it down. Receiving a compliment is sure to enhance your mood. Just a few kind words can have a big impact. Giving compliments can have a positive effect on your mood, too. The opposite is also true. A few unkind words can result in a bad mood. Keep that in mind when you're talking to others. If you have children, you know what they're like when sleep-deprived. You're not much better! Ensure that you're getting enough sleep that your mood isn't being affected negatively. It's common to have a mild reaction to certain foods and not even be aware of it. Try eliminating certain foods from your diet for a couple of days and see if it changes how you feel. * Peanuts, which aren't actually a nut. * Anything with a high sugar content. You might not consider financial issues to be a "small thing," but even small financial issues can harm your mood. For example, one unexpected bill can create a lot of emotional turmoil. Whether it's a coworker, family member, or friend, spending time with a very negative person can sour your mood. Interestingly, when you least feel like exercising, doing so seems to have the biggest positive influence on your mood. A brisk walk is all you need to boost your mood. It doesn't take much to make a difference. You don't need to purchase a sports car or vacation if you're looking to boost your mood. 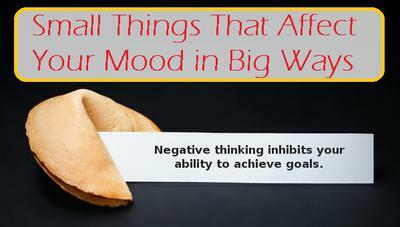 There are plenty of smaller things that can change your mood significantly. These small things can occur on a daily basis and are well worth the effort to either seek or avoid. Focus on the small things that enhance or detract from your mood and you'll enjoy pleasant moods more often.